With over 50,000 tonnes of food and drink predicted to be thrown away from Scottish homes in December alone, Zero Waste Scotland is urging people to plan ahead, resist over-buying, and to do their bit to cut the amount of food thrown away over the festive period. Richard Lochhead, Cabinet Secretary for Rural Affairs, Food and the Environment, has teamed up with Scottish chef Tony Singh to urge people to be more responsible with regards to food waste. The advice comes as part of the current European Week for Waste Reduction (21st–29th November), which encourages people throughout Europe to arrange activities which promote the importance of reducing waste. 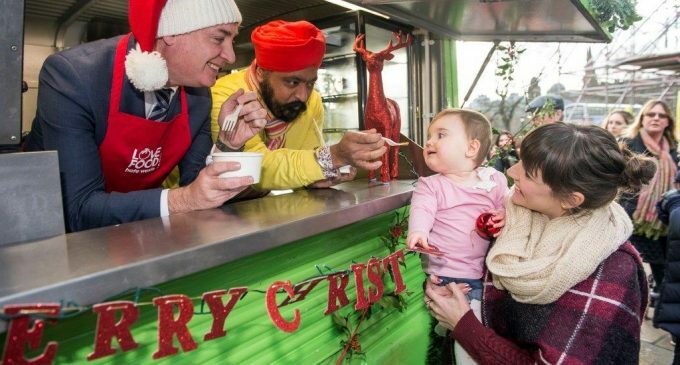 Mr Lochhead, pictured above with Tony Singh, said: ‘Since 2009, avoidable food waste in Scotland had dropped by almost eight per cent, representing an annual saving of around £92m for households throughout the country. You can keep waste to a minimum when cooking Christmas dinner by calculating and controlling portion size. Do a few simple calculations based on your Christmas Day guest numbers. In the restaurant trade, we create recipes around an adult- or child-size portion. You can do this by applying a simple formula of 140g turkey (100g for a child), two tablespoons of carrots (one for a child), two florets of cauliflower (one for a child), four brussels sprouts and one parsnip (1/2 for a child), to each portion. Multiply that quantity by the number of guests you’re entertaining and don’t be tempted to overload your guests’ plates! Don’t worry if you make a bit too much on Christmas Day itself; you can continue to plan ahead for the days following Christmas by keeping your festive leftovers aside to make some very quick, easy and healthy alternatives. Have a very specific Christmas food shopping list, based on pre-calculations. Remember to check your cupboards first, too, as you may already have many of the ingredients you need. Make a conscious decision not to get sucked in by the glossy advertising, marketing and special offers around Christmas time. Stay focused and only buy what you need. Think ahead about your guests’ preferences. Leftover cheese needn’t be wasted, either – it freezes well and can be kept frozen until you need it later – perhaps at New Year. Save time and reduce hassle by preparing as much in advance as possible. By washing, chopping, bagging and freezing your veg in advance – such as sprouts and carrots – you can save a lot of time and they will retain the same nutritional value as if you prepared them from fresh. Place an advance order with your local grocer or butcher for exactly what you need. And don’t throw out your leftover mince pies – check the use-by date, and if you know you’re not going to eat them, save them and take them into work for your sweet-toothed colleagues post-Hogmanay! For more information on reducing food waste, visit www.zerowastescotland.org.uk.